Baskin-Robbins goes with new, winter-y Oreo Cool Mint Chocolate as December's Flavor of the Month. 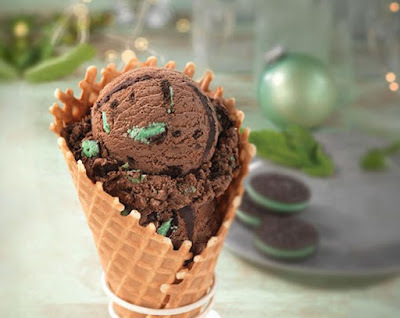 It features chocolate ice cream with pieces of Mint Creme Oreo cookies and a dark peppermint fudge ribbon. 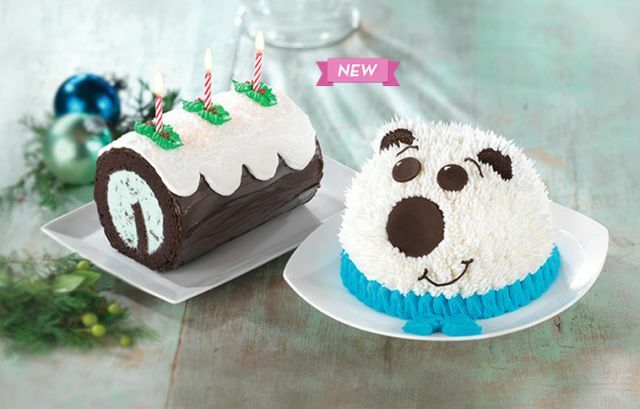 Also available for the holiday season are two festive cakes: the new Polar Bear Dome Cake and the new Fudge Yule Log Roll Cake. The Polar Bear Cake features a white icing coat that's made to look like fur and a blue icing scarf, plus Oreos for ears and chocolate eyes and nose. The Fudge Yule Log roll Cakes is covered with a snow of white frosting and glitter. Both can be made with whatever ice cream flavor you like. Finally, Baskin-Robbins finished up their Celebrate 31 promotion this year with a deal of $1.31 regular and kids scoops and $3.31 two-scoop sundaes on Thursday, December 31, 2015 at participating locations.